Much of the current evidence for the loop extrusion hypothesis comes from molecular dynamics simulations. In these simulations, DNA is modeled as a polymer, loop extruding factors with certain parameters are added into the mix, and the polymer is allowed to move around as if it were in a solvent. By running the simulation for a long time and saving conformations of the polymer at defined intervals, you can gather an ensemble of structures that represent how chromatin might be organized in a population of cells. Note that molecular dynamics is much different than MCMC approaches to simulating chromatin structure – here we’re actually simulating how a chromatin might behave due to physical and chemical properties. In this post, I’m going to show you how you can run these molecular dynamics simulations for yourself. The simulations rely on the OpenMM molecular simulation package, the Mirnylab implementation of openmm-polymer and my own scripts and modification of the mirnylab code. 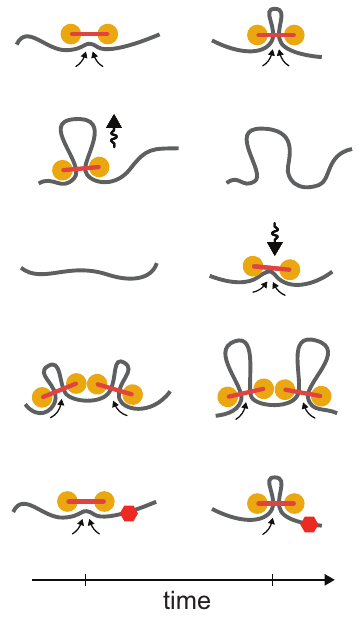 Pick your favorite chromatin region to simulate. In this example, we’re going to use a small region on chromosome 21. Define CTCF sites, including orientation and strength. These will be used as blocking elements in the simulation. The standard is to take CTCF binding ChIP-Seq data for your cell type of interest, overlap the peaks with another track too add confidence and determine orientation (such as CTCF motifs in the genetic code or RAD21 binding data). Define other parameters for the simulation, such as the time step and number of blocks to save. These can be found in the help text for the simulation script. Before running a time consuming 3D polymer simulation, you can run simple test to see how the extruding factors are behaving in the simulation. 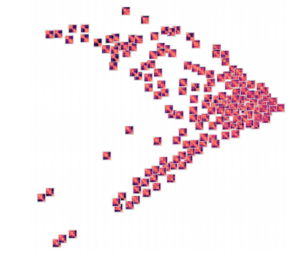 This 2D map gives the probability of an extruder binding two sites along the linear genome, and is a good prediction for how the mean 3D structure will look. Briefly, there’s a logistic scaling function that transforms an arbitrary ChIP-Seq peak strength into a 0.0-1.0 interval. The scaled strength of the each site defines the probability that a LEF can slip past the site without stalling. 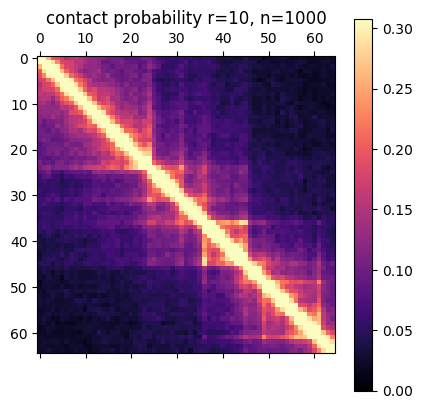 Even though CTCF might form an impermiable boundary in reality, modeling this with a probability makes sense because we’re generating an ensemble of structures. You might need to tune the parameters of the function to get peak strengths to make sense for your ChIP-Seq data. Loop extruder occupancy matrix. This gives the log transformed probability of a LEF binding two locations along the genome. CTCF sites for the example region of interest are shown above, with the color indicating directionality and height indicating strength. Notice how we already start to see domain-like structures! With all the above ingredients and parameters configured, it’s time to actually run the simulation. Here we will run for a short number of time steps, but you should actually let the simulation run for much longer to gather thousands of independent draws from the distribution of structures. Some explanation of the parameters: time_step defines how many steps of simulation are done between saving structures, skip_start makes the script skip outputting the first 100 structures to get away from the initial conformation, save_blocks means we will save 1000 structures total. There are many other arguments to the script, check the help text for more. In particular, the –cpu_simulation flag can be used if you don’t have a GPU. If everything is configured correctly, you’ll see output with statistics on the properties of each block. There are a few ways you can analyze the results after the simulation has finished. 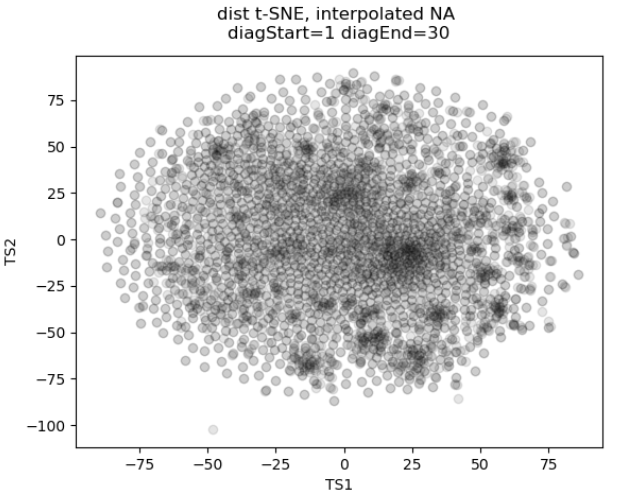 The obvious first step is to create an average contact map from the ensemble of structures. This plot is the most comparable to a Hi-C dataset. Simulation contact probability at radius of 10. 1000 structures went into this plot. 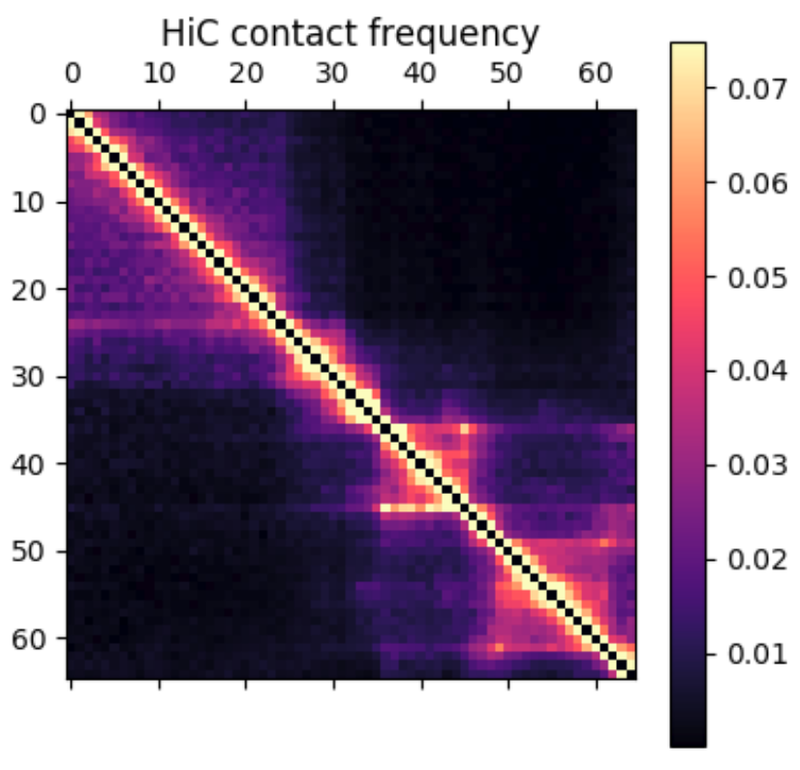 Hi-C contact frequency for the same region in K562 cells. A great qualitative match, inluding domains and peaks! Another common way to look at chromatin structure data is plotting contact probability as a function of genomic distance. This function is expected to decrease linearly on a log-log plot, with the slope giving evidence for mechanism for packing the underlying structures. You can look at the radius of the structures, how they cluster, and many other metrics. More on this to come later! Is loop extrusion responsible for the 3D structure of the genome? 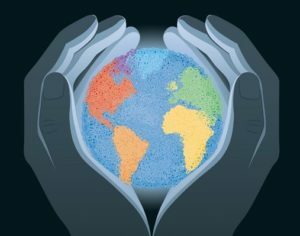 It’s generally accepted biological knowledge that chromatin is organized in a complex and tightly-regulated manner inside the cellular nucleus. High-throughput chromatin conformation capture (Hi-C), microscopy experiments and computer simulations have added much to our knowledge of chromatin’s three dimensional organization. However, there still isn’t a consensus on the molecular mechanisms actually responsible for such organization! A major advance in the past few years was the formalization of the loop extrusion hypothesis. 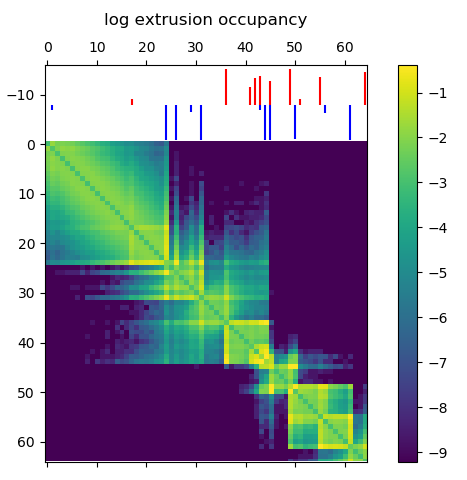 Loop extrusion explains many features of experimental data – and I’m going to describe it in detail soon. However, we still don’t have conclusive mechanistic evidence that it is actually happening inside the nucleus. New research is continually adding to the body of evidence for the hypothesis, though, so it looks like loop extrusion is here to stay. Chromatin in the nucleus of the cell is organized in an incredibly robust and precise way. Over 2m of linear DNA has to fit into the nucleus, around 10µm in diameter. Each chromosome has to be faithfully replicated every time the cell divides, chromatin has to be “opened” and “closed” in response to external signals, and transcriptional machinery has to be able to access each gene to express mRNA and produce proteins. Past research has shown that the genome is organized at different levels (compartments, domains, sub-domains), and contains “peaks” of increased 3D interaction at specifically defined loci, often between binding sites for the transcription factor CTCF. Any mechanistic model for chromatin organization needs to take all of these factors into account. Loop extrusion considers the action of extruding factors – most likely the proteins cohesin or condensin. Extruding factors are typically thought of as pairs of proteins with a fixed linker between them. They bind DNA and each member of the pair translocates along the polymer, effectively extruding a loop. Unhindered, an extrusion complex will process along the DNA until it dissociates. If an extrusion complex encounters another, both will stall at that position on the DNA. The model also considers blockers – most likely bound CTCF – that can stall extrusion complexes. Blockers are modeled to be directional (they only block extruders moving in one direction) and semi-permeable (they let an extruder pass with a certain probability). For a video explaining the action of loop extrusion, see this post. Loop extrusion provides a simple unifying principle to explain 3D genome structure. Initially, the best evidence for this hypothesis came from simulation using molecular dynamics – simulating the action of loop extrusion complexes on a polymer constructed to mimic DNA. By placing blocking sites at locations where CTCF was bound in the genome, these simulations closely reconstructed experimental Hi-C data. 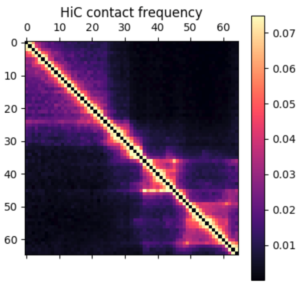 In addition, loop extrusion can explain what Hi-C contact maps look like after removing CTCF binding sites with CRSIPR genome editing. There’s a interesting history of the loop extrusion hypothesis – it’s actually not a completely novel idea for explaining genome architecture. A report in 1990 by Arthur Riggs  proposed “DNA reeling.” Then, Kim Nasmyth mentioned that an extrusion-like mechanism might play a role in separating sister chromatids and genome organization in 2001 . However, the idea was buried in a 75 page article. Nasmyth even discouraged the idea, “I give this example not so much because it is a serious candidate for the function of condensin (or cohesin for that matter) but rather because it illustrates the notion that condensin or molecules like it could have a very active role in folding and resolving chromatids.” As far as I can tell, loop extrusion went untouched until a publication by Alipour and Marko in 2012 , who proposed an extrusion-like mechanism could be used to compact mitotic chromosomes. Then, concurrent publications by the Mirny and Lieberman Aiden groups formalized the idea [1,2]. The timing of these publications was interesting – a preprint of one came out while the other was in review. However, the authors maintain that the ideas were developed independently. Further biophysical experiments will likely give us more confidence about loop extrusion. In particular, evidence in human cells with human cohesin/condensin is lacking. 1. Fudenberg, G. et al. Formation of Chromosomal Domains by Loop Extrusion. Cell Reports 15, 2038–2049 (2016). 2. Sanborn, A. L. et al. Chromatin extrusion explains key features of loop and domain formation in wild-type and engineered genomes. 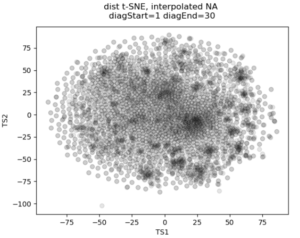 PNAS 201518552 (2015). 3. Riggs, A. D. DNA methylation and late replication probably aid cell memory, and type I DNA reeling could aid chromosome folding and enhancer function. Phil. Trans. R. Soc. Lond. B 326, 285–297 (1990). 4. Nasmyth, K. Disseminating the Genome: Joining, Resolving, and Separating Sister Chromatids During Mitosis and Meiosis. Annual Review of Genetics 35, 673–745 (2001). 5. Alipour, E. & Marko, J. F. Self-organization of domain structures by DNA-loop-extruding enzymes. Nucleic Acids Res 40, 11202–11212 (2012).